Arthur, one of eighteen children, was born at Long Bay, Akaroa, on April 14, 1881. His father Francois Leonor Narbey was born in Rouen, France, on September 3, 1928. He had served in the French Navy, and arrived at Akaroa in 1849 on the ship Angeline. On January 28, 1857, he married Mary Magee who was born in Woolwich, Kent, London, on September 16, 1835, the daughter of John and Maria Magee nee Scott. Mary had come out to New Zealand with her family on the Duke of Bronte, arriving in Lyttelton on June 5, 1851. Francois and Mary farmed at Long Bay, Akaroa, eventually acquiring the whole of the bay, a total of 4000 acres. Arthur was privately educated and also later attended the Akaroa Primary and District High Schools. He had learned the piano and was keen on football, playing for the Akaroa Seconds team. 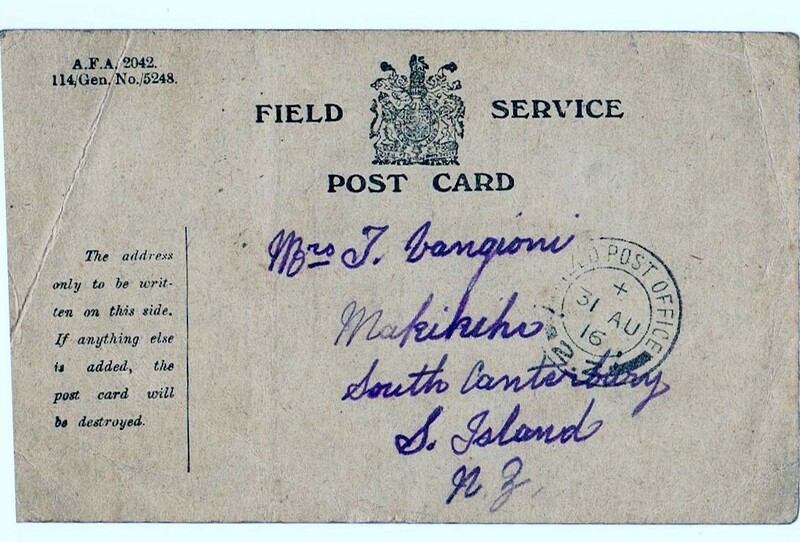 In 1915 when he enlisted on August 25, he was working at Makikihi for his brother-in-law Thomas Vangioni, who had married his sister Sera. Being single, Arthur nominated his sister Rose Adelaide Narbey of Jollie Street, Akaroa, as his next of kin. For some reason he quoted on enlisting his birth year as being 1883, when in fact it was 1881, and age as 32, when he was 34. He was described as being Roman Catholic, 5 foot 9 ½ inches tall, chest measuring 35 – 37 ½ inches, weighing 160 pounds (73 kgs), of dark complexion, grey eyes, black hair and his teeth being only fair. Arthur was posted to the Otago Mounted Rifles (OMR), D Squadron, and entered camp at Trentham. On September 15, he was admitted to the Grand Stand Ward, Trentham, with influenza. At Trentham he would have done some basic infantry training before moving to Featherston Camp for more advanced training in tactics and horsemanship. On January 8, 1916, he embarked at Wellington with the 9th Reinforcements aboard HMNZT37 Maunganui. The Maunganui travelled in convoy with HMZNT 38 Tahiti and HMNZT 39 Warrimoo carrying a total of 2406 troops, arriving in Egypt on February 8, 1916. On September 16 Arthur was admitted in the field to the 2nd Field Ambulance and transferred to 1/1 SMD Casualty Clearing Station (CCS) the same day, then to No1 Canadian General Hospital at Etaples on September 19. From Etaples on September 22, he boarded the Hospital Ship Asturias, and was admitted to 1 NZ General Hospital at Brockenhurst the following day. After over two months treatment, on December 16, 1916, he was attached to the Command Depot at Codford where, from March 25-30, 1917, he was admitted to 3 NZ General Hospital with scabies, and from April 7–25, with trouble with his thigh wound. 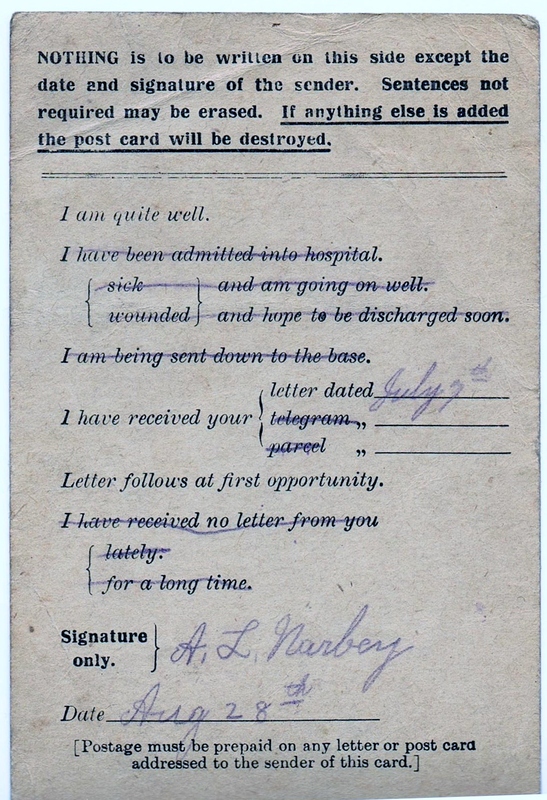 The Akaroa Mail and Banks Peninsula on April 27, 1917, again reported “Word has been received that Rifleman Arthur Narbey, of Long Bay, has been wounded a second time. He was wounded on April 7th in the thigh and evidently the wound is of a serious nature, as his family have received a cable to the effect that he is being sent out to New Zealand as a cot case. Rifleman Narbey left with the 9th Reinforcements, and was wounded in August in the Somme battle.” This report was incorrect as at this time he was in England. By August 13, he was back with the Reserve Battalion at Sling Camp, before leaving for France on October 29, 1917, and marching into camp at Etaples. On November 11, he re-joined his battalion in the field who were preparing for a return to the Ypres area and for launching an attack on the enemy stronghold known as Polderhoek Chateau. On November 26, Private Narbey, along with 400 others, was detached for duty to the NZ Ordnance Depot, where extra troops were required for stretcher parties and carrying water and rations for the front line, before re-joining his unit on December 16. The NZ Division was to spend the winter of 1917-1918 in the Ypres area. In late February 1918 the Division moved into the Corps rest area for refitting and reorganising, and spent some time at Moulle carrying out tactical, gas, rifle and Lewis gun training. On March 22 1918 their period of rest came to a sudden halt with the beginning of the expected German offensive. The Division moved to the Upper Ancre Valley where they were to be involved in heavy fighting, holding the road to Amiens, and in April they took over part of the Hebuterne sector. On May 4, 1918, Private Narbey was posted to 1 NZ Field Division Employment Company. This unit provided light work for soldiers in poor physical health and classed as unfit for further military service, and undertook labouring work whereever they were stationed. On October 16, 1918, Private Narbey was sentenced to 6 months Imprisonment with Hard Labour for joining in a mutiny in forces belonging to HM Forces in that they, in the field on September 15, 1918, joined in a mutiny by joining together not to work in the Divisional Laundry when it was their duty to do so. For some reason this sentence was suspended on October 29. On December 22 he marched in to Sling Camp (ex-France), and on January 14, 1919, was again in trouble, being awarded seven days Field Punishment (FP) No.2 for being absent without leave. In FP No.2, the prisoner was placed in fetters and handcuffs but was not attached to a fixed object and was still able to march with his unit. On January 28 he was posted to B Group at Codford. Arthur finally left England from Liverpool aboard the SS Ajana on February 2, arriving at Auckland on March 26, 1919. After having served a total of 3 years and 242 days, he was discharged from the army on April 23, 1919, as no longer physically fit for war service on account of wounds received in action. For his service he was later awarded the British War Medal and Victory Medal and his name is on the Akaroa High School Roll of Honour. Arthur returned to his home at Jollie Street, Akaroa, where he remained up to about 1938, working as a farmer and labourer, and enjoying the odd game of cards and gardening. Between 1946 and 1949, he moved around a bit working as a labourer at the Public Works Department, The Birches, Ashburton, Eyrewell Forest, Rangiora, the Cobb Valley Dam in the Buller, and finally as a caretaker at the Public Works Depot Tawa Tapu, Plimmerton, Wellington. In 1954 he was living at the Waverley Hotel in Marion Street, Wellington, before retiring back to Jollie Street, Akaroa in 1957. Arthur died at Akaroa on February 1, 1959, and is buried in the Catholic Section of the Akaroa Cemetery. Two of Arthur’s brothers also served during World War One: 65001 Private Archibald Andrew Phillip Narbey served with the 2nd Battalion Auckland Regiment in Western Europe; and 84357 Private Edmound Florantin was called up for the 44th Reinforcements, but did not serve overseas.